Backlit displays are graphics that are lit from behind and thus have more color depth. They demand attention! Our backlit graphics are printed on 6 mil backlit film with UV stable inks. The colors are vibrant and accurate. Product life is 5 years indoors, and 2 years outdoors. The film is typically placed between two sheets of plexiglass in a light box. Maximum width is 48" full bleed, with just about unlimited length. Backlit display material can be covered with our crystal laminate for use on trade show backlit frames that come with many trade show booths. This material has a total thickness of 21 mils, and can be attached with VELCRO® Brand fasteners to the frames. Call for pricing. We can produce backlit display material from all the common graphic design programs. Lead time is a day or two for all back light materials. Order backlit material for light boxes where it will be sandwiched between sheets of plexiglass. 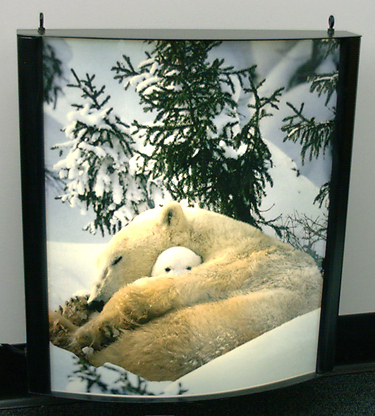 For trade show booth frames where it will be attached with VELCRO® Brand fasteners, order backlit crystal laminated. This adds the stiffness necessary for this application.